In this incisive analysis of one of the most spectacular economic breakthroughs in the Deng era, Jean C. Oi shows how and why Chinese rural-based industry has become the fastest growing economic sector not just in China but in the world. 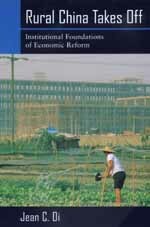 Oi argues that decollectivization and fiscal decentralization provided party officials of the localities—counties, townships, and villages—with the incentives to act as entrepreneurs and to promote rural industrialization in many areas of the Chinese countryside. As a result, the corporatism practiced by local officials has become effective enough to challenge the centrality of the national state. Dealing not only with the political setting of rural industrial development, Oi's original and strongly argued study also makes a broader contribution to conceptualizations of corporatism in political theory. Oi writes provocatively about property rights and principal-agent relationships and shows the complex financial incentives that underpin and strengthen the growth in local state corporatism and shape its evolution. This book will be essential for those interested in Chinese politics, comparative politics, and communist and post-communist systems. Jean C. Oi is Associate Professor of Political Science at Stanford University and author of State and Peasant in Contemporary China: The Political Economy of Village Government (California, 1989).